Blue Tansy is produced from a seasonal crop that requires optimal conditions, and is available in limited quantities. This is what is in some of the most popular blends like Valor, Peace & Calming® and JuvaFlex®, so if the crop doesn’t have optimal conditions this is why many times Young Living will be out of these products. So NOW that Blue Tansy is available as a single oil you WILL want to get one for yourself so you can diffuse, apply topically, and share! Blue Tansy’s rarity and complexity is part of its allure. 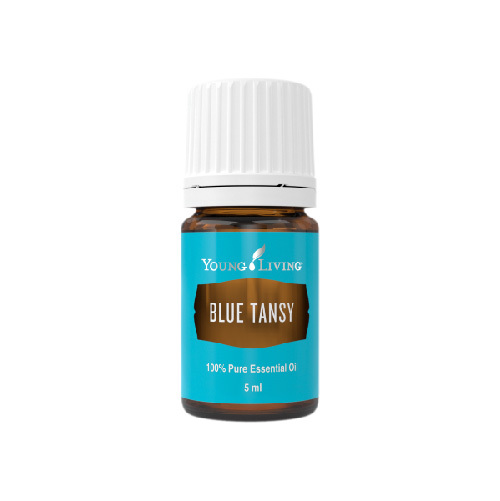 This essential oil that is often compared to a fine wine, Blue Tansy essential oil is fresh and enticing with a sweet aroma. It is know for encouraging the spirit, relieving pollen related woes, soothes and clears congested skin, supports self-esteem and confidence. Diffusing or softly inhaling Blue Tansy in a space in need of peace and tranquility can help soothe nervous tension, and only a drop or two will do. Combines well with Lavender Ravintsara, Pine, Cedarwood Rosemary and Helichrysum. Some of the best uses for Blue Tansy are support for muscles and skin care. Using with caution when using as a massage because the blue oil might stain the fabric. Blue Tansy is a very peaceful oil, supporting a calm and peaceful environment. Just inhale the scent and see how it makes you feel. Fall in love with Blue Tansy. Interesting is that the blue does not come from a blue flower, it’s a component chamazulene is what makes this oil the beautiful blue color it is also know for it’s skin care properties. Studies show that the color blue is one that evokes senses of calmness, relaxation, and peace. Nature must be onto something, because this violet-blue botanical compound does exactly that. Here are a few simple things you can do with your new found love. *Please note: With any recipe’s involving bath or massage blends, always test on a small part of your skin first before using all over your body. Please be sure your skin can handle the blend before being covered in it. Mix together apply and let sit 20 minutes before rinsing. Careful not to get into eyes or mouth. 1 Tablespoon Fractionated Coconut Oil, Jojoba oil, V-6 or whatever oil is your preference. Massage into desired targeted area as often as needed. Massage into shoulders, upper back, and neck. Can also diffuse, without the carrier oil. Or put together in a bottle and add 6 drops of mixture to your diffuser, diffuse at bedtime to help support a restful sleep. 1 tablespoon of Jojoba oil and 1/2 cup of Epsom salts. Stir together and add to a full tub to give you a tranquil and soothing soak.